Whether you’re booking for 7 or 700, planning a journey in the UK, Europe or Worldwide for numerous people can be a difficult task. RailTourGuide have a specialist team working solely on group and corporate travel so we can provide an exceptional service, giving you exactly what you’re looking for. 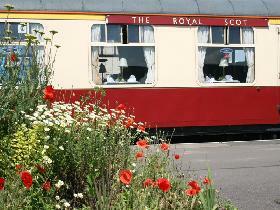 Why not hire your own train from the experts in UK TRAIN HIRE? it is really easy and we are here to help you along the way. It is possible for large groups to hire a complete train – coaches, locomotives, stewards, chefs and your very own train manager. Trains can be configured in any way you wish. All standard class train for the movement of large numbers of guests complete with a buffet car. All first class for a more luxurious journey also complete with a buffet car. All first class dining – the height of luxury with its on board meal service freshly prepared in the kitchen cars. Mixed trains of the above. Pullman service – vintage brown and umber liveried carriages with fully uniformed carriage attendants – luxury at its most opulent. Being experts in whole train charters we are able to steer you through the mine field of operating law – which locomotive can run where, what stations to call at, menu selection, head board design, ticket issuance, even where to go and what to do when you are there – ask us we are truly the railway experts. Please call us on 0191 246 0708 or email sales@railtourguide.com for more details.